Wie lassen sich Lehr- und Lernprozesse erforschen? Angesichts der neoliberalen Funktion von Evaluierungen für die Ökonomisierung und Modularisierung von Bildung und der notwendigen Intimität pädagogischer Verhältnisse ist dies keine leichte Frage. Sie wurde in den letzten Jahren zunehmend gestellt und hat in diesem Zusammenhang mehr Folgefragen aufgeworfen denn emanzipative Antworten für eine nächste Gesellschaft generiert. Nun scheint ein künstlerisches Projekt in diesem Zusammenhang Überzeugenderes zu leisten als so manche didaktische Untersuchung: Smadar Dreyfus hat über einen Zeitraum von zwei Jahren Tonaufnahmen in Tel Aviver Schulen gemacht, diese penibel transkribiert, übersetzt und dabei sehr genau gearbeitet, um so viel wie möglich von dem, was im Klassenzimmer gesagt wurde, zugänglich zu machen. Dabei fällt auch gleich auf, dass dies viel mehr ist als die Lehrenden selbst hören und aufgreifen konnten. Aus dem Prozess der Investigation – der Kooperation mit den Schule, der Aufnahme, Transkription, Übersetzung und Redaktion – entwickelte Dreyfus eine raumgreifende Installation bestehend aus dem Sound und der visuellen englischen Übersetzung von 7 Schulstunden und einer Pause in israelischen Schulen, deren Intensität es sich schwer entziehen lässt. Die minutiöse Arbeit hat sich gelohnt, denn durch die künstlerische Forschung tritt am empirischen Material das gemeinhin nicht Gehörte in der „Black Box“ Klassenzimmer zutage. So zeigt „School“, dass in jedem Klassenzimmer Hegemonie nicht nur eingeübt wird, sondern immer auch umstritten ist. Denn die Lehr- und Lernsituationen, deren ZeugInnen wir in der Installation werden, sind nicht nur stets von machtvollen Erzählungen, disziplinierenden Organisationsstrukturen und nationalen Deutungsmustern durchzogen, sie sind auch Schauplätze von Ungehorsam und Desinteresse und sie sind durchdrungen von der Lust am Wissen und dem Wunsch nach Veränderung. So verdanken wir dem Projekt endlich konkrete Einblicke in die Widersprüche, die Bildungsräume durchziehen. Denn die Stimmen, die wir hören, erzählen von viel mehr als jeder Fragebogen ermitteln könnte: Sie ordnen sich unter und fügen sich ein, sie versuchen zu folgen und spielen sich aus, aber sie flüstern auch dazwischen und quatschen hinweg, sie langweilen sich sichtlich, weigern sich trotzig und helfen zusammen, sie sprechen zurück und lehnen sich auf. EB: I’d like to start by asking what led you to begin researching Tel Aviv schools? SD: School began as an autobiographical research, emerging from my own background. I was born and grew up in Tel Aviv, and since moving to London in 1990, my relationship to where I come from has increasingly become the source of a sense of urgency in my work. For me, the research and the work are forms of returning. Until recently, when going to vote in Israel, I used to go to a polling station located in my old school, which was a rather strange and somewhat melancholic experience. Wandering through the school corridors, I was reminded of the voices that I experienced in my own education and the impressions they left. I have a very strong memory of how teachers spoke and how they used their voices: they had a particular vocal inflection. To me, voices enact spatial and social relations and what has emerged in my research over the years is in part the implicit social and cultural conditioning that is embedded in the voice. School started as an open-ended idea: there is a shared intimacy between teacher and pupils, but also there is a kind of performance that goes on in the classroom. I wanted to see if I could get an insight into these spaces, which are part of a public institution but are actually closed to most of the public: even parents don’t get to see what’s going on in there. It was also a matter of curiosity to see if and how it has changed since I was a pupil in the 1970s. Can you describe the process of research and -recording? Initially I got permission to sit in on a couple of lessons, to listen to the teacher. Then I realized how fascinating it was to listen to the pupils as well, to their responses and interactions with the teacher, how they behave. They form different groups, like microcosms; each classroom a kind of mini-society. This made me think about just how we are marked by these relationships. Who is your friend? Who is not your friend? Who’s smarter than whom? How do you converse with the teacher? All these little preoccupations are a part of becoming, part of a process. I discussed the classroom setting with the sound recordist who was working with me, and we began experimenting with ways to record the field of voices in the classroom spatially. I wanted to dislocate this field of voices and sounds, and then to reconstruct them spatially for the visitor in the installation. How the viewer-listener is positioned in relation to voices and sounds is always a central consideration in my work, so the recordings needed to reflect the directionality of the multiple voices and to register where they were situated in the classroom space. This process led us to develop a multidirectional web of microphones attached to the classroom ceiling. At the same time, it was necessary to convince the institutions to let me in, to get used to my presence, and to have some understanding of my project. I applied to the Israeli Ministry of Education for permission to record in the schools, and they agreed but posed a set of conditions and constraints: I was not allowed to film or photograph the lessons, identify anybody by their full name or identify any of the schools. For each school there was a long process of achieving consent: when the headmaster was open to cooperation, I also explained the project to the teachers, pupils, and parents to get their consent. I was instructed not to interfere with or interrupt the school’s timetables or its daily operations, so I had no control over the content of the lessons that were taught or any other aspect of the way the lessons were run. Finally, the sound recordist and I were not allowed to be present in the classroom during the lessons: we installed the microphones in advance and then had to wait in the corridor during the recording. In fact, I only listened properly to the lessons when I was back in my studio in London – that was the moment when I was confronted with the material as decontextualized, pure sound. I then engaged in a kind of forensics, a close analysis of recordings of what at first sound like banal exchanges between teacher and pupils. I became obsessed with picking out every utterance and placing it as text on the screen. I also found that the microphones picked up speech and sounds that the teacher hadn’t heard and these revealed a great deal about the class dynamics and its undercurrents. How did you go about selecting the particular recordings to use? It was important to me to have a multiplicity of voices and a range of subjects in School and to see how different modes of delivery by different teachers affect their interaction with the pupils. I recorded 68 lessons over a period of two years. Given the conditions that had been set for me, the lessons were necessarily randomly recorded. After the intensive and extended periods of time spent listening and editing, I finally selected seven of the 68 lessons for the installation. This was a hard but significant part of the process. Each lesson was carefully edited down to about 23 minutes: it was a fine line, as I had to bear in mind the danger of distorting the meaning of what the teacher and the pupils were saying by taking their words out of context. The variety of subjects, the quality of the teacher’s voice, the pupils’ voices, their language, their interactions with the teacher and amongst themselves, and how they relate to the subject taught – these all became considerations that contributed to my selection. So School is born of subjective research; it is not an attempt to give a documentary report or to do statistical research on the conditions of education in Israel. What kind of schools are these and what kinds of pupils attend them? The Israeli education system is wide and varied, and it’s sectarian: there are ultra-orthodox schools, Arab schools, Kibbutz schools, etc. I wanted, however, to revisit the kind of education that I had, schools that I went to, or similar. The pupils whose voices are in the work come from a range of socio-economic backgrounds, but overall it’s secular state education. You could call it middle Israel. And how old are the pupils? It strikes me that a work such as this could be made in relation to university students or younger children, but you have very specifically chosen to work with pupils of a particular age. The children are between 11 and 15 years old. I focused on this age group because I specifically wanted to capture the performance of the voice in a particular time of transition, both physically and mentally. It’s during this period of early adolescence that one starts forming an adult identity. It’s a complex process, but at this stage children establish a more conscious relationship to the world outside the family. School is very immersive, but it’s notable that this immersion is achieved in a dark space with no concrete reference to a classroom setting, such as the presence of chairs or desks. You have a point here, but I would add that the architectural structure of School does retain a crucial spatial principle from school settings: it has a set of rooms that are connected by a corridor. No other feature of a school en-vironment as we know it is represented. This is quite -intentional, because not only do I not want anything to distract from the sound, but I would also like to avoid any visual references to particular locations and cultures. I dislocate the sounds into this dark, visually blank space but I keep the spatial arrangement of the rooms and the corridor to create a directional sound environment and form a specific experience for the viewer-listener. This space of experience will be different for each viewer-listener depending on the particular trajectory he or she takes through the installation. Yes, from the outset it made sense to me to have a multiplicity of lessons – one in each room – and for the visitor to experience this multiplicity, at times simultaneously, in the corridor. This space is where the visitor wanders between the classrooms, where her route forms an unpredictable narrative that she accumulates from one lesson to the next. The seven lessons play at the same time, and the visitor juxtaposes the lessons in her trajectory and in her experience; she stumbles, say, upon history, then maybe into biology, or suddenly encounters Arabic, at times even coming across the same lesson twice rather than going through all the complete lessons in a prescribed order. When the cycle of lessons ends, the sounds of a school break fill the corridor: kids running and shouting, doors slamming. It is a kind of release. Then the lessons start again in all the rooms. What is created is an affective space, which I believe is also a productive one. The sound touches you in an unpredictable way and produces something within you. I find it fascinating that something in these sounds can move from one culture into another culture through this experience. 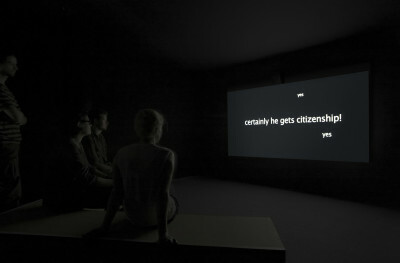 In your earlier installations Lifeguards (2002–05) and Mother’s Day (2006–08), you use the same technique of visualizing voices through projections that transcribe and translate what is being said, but in those installations you retain the use of representational images. Here, you dispense with the representational image entirely, which strikes me as significant. What is at stake in the absence of the image in School? I find sound more visceral, more intimate than an image, and in my work I focus on very specific sounds that encompass the voice, which is a highly loaded and emotive element. In Lifeguards and Mother’s Day, I separated sound from image and placed the viewer-listener inside the “cut” between the two; for School I was thinking differently about the position of the visitor. Without the apparent certainty of an image you are stepping into something else, something ambiguous that is outside what is knowable. It activates a subjective experience and opens up this experience to a range of potential meanings. In darkness one listens differently as well as directionally, and School makes use of that experience and gives it weight. The voice field and soundscape are concrete in the sense that they conjure up an image in the mind’s eye. Without a representational image to guide you, you are cast into the amplitude of your own memory of voices in education. Paradoxically, the loss of a sense of embodiment when in darkness is important in enabling this to happen: it facilitates your immersion in the soundscape. Not only are you addressed by the teacher’s voice, but you also find yourself among teenagers who are often distracted, bored, and opinionated. You get drawn into that scene, you start taking sides, deciding you like certain people and not others. You inevitably feel as if you are addressed by these voices; you become situated as another subject and implicated in the scene in which you are moving. It strikes me that the thematics of translation form a red thread throughout School. We move from the space of the school to the space of the installation, from spoken language to text, and from Hebrew to English. What is the significance of translation in your work? I often work with materials from Israel and in my primary language, Hebrew, which compels me to consider what it means for a visitor to encounter these materials in another culture: how the work embodies an act of translation, how to characterize the position and experience of being a viewer/listener/reader, and how to make it a productive position. And yes, you are right, School is in many ways a work of and about translation. The teacher interprets “knowledge” that comes from prescribed texts to the pupils (each teacher of course has a different approach); the pupils discuss their understanding of the lesson (it is not only the text); the discussion and any audible utterance in the classroom is translated from Hebrew to English, edited and merged together as visual text on the screen – disciplinary events and outbreaks of hilarity included. And of course, there is the spatial translation of School and how the visitor is positioned in a place of translation. As a visitor you have work to do: you are always grappling to understand what’s going on. In my work this goes back to Lifeguards, in which I used the translation of speech to present contradictions and misunderstandings between the gesture of the voice and the meaning of what is being said. In School, the visitor is listening and reading, coping with interruptions and distractions, interpreting and contextualizing; she is constantly in translation and translating. A major aspect of the affective dimension of the work is the experience of reading the projected titles, synchronized with the rhythm of the voices. Sometimes they are too fast and numerous to fully comprehend. Can we perhaps understand the viewer’s inability to keep up with the speed of the titles as an allegory of the failure of translation to ever truly give a complete rendering of the original? Yes, there is a certain inability to read absolutely everything, even for native English speakers. To me, this is part of what it means to be in translation: it is never complete, it is always partial, and you have to make do with partial knowledge. I deliberately construct the situation so that the visitor is left to fill the gaps, to actively reconstruct what is being said, and in the process she gradually becomes more implicated. It’s a matter of knowing that one doesn’t know everything and can’t understand everything. Instead, we recognize that partiality and acknowledge it. This seems to me to be at the heart of what it is to have an ethical relation to another culture. It’s an essential layer within the whole experience, yes. Perhaps it comes from the fact that I inhabit this on-going condition of translation, oscillating between two cultures and languages. In a sense, I try to reproduce that for the visitor. For example, when you read the synchronized titles, the rhythm in which the words are uttered and the breathing of the speaking voice become the rhythm of the flashing titles. I think this is particularly relevant to the experience of the non-Hebrew speaking visitor: she is listening to a language that is foreign to her, and she can see and feel its rhythm as well as its sounds through her body while trying to keep up with its translation. The whiteness of the titles creates a pulsation of light in the dark room. Again, it’s another example of the affective dimension of the installation. The rhythm of the work choreographs sounds, light, and darkness in relation to the architecture of the space. School could be considered as the dark interior of a time capsule, an all-encompassing, polyphonic, orchestrated environment that affects the visitor with its own rules and principles. Throughout your work, we see a distinct interest in historiography. However, it is what we might call a “minor history,” not in the sense that it is insignificant but in that it leaves behind the big events and the major players. Instead, you focus on small, quotidian moments. Is it fair to say that you approach geopolitical issues through the documentation of everyday lived experience? As I mentioned earlier, I come to subjects in my work through my personal experience and from my relation to the voice. I am interested in how these are affected by and implicated in social and political conditions, but I am also grappling with my personal relation to these conditions, my mixed relationship with the place I come from. I think this reveals something about how geopolitical issues reverberate in everyday life and situations, and this is how the work has much wider implications than its content might otherwise imply: it oscillates between a specific locality with its cultural narratives, and wider concerns about the relations between the individual and the collective. So how important is the political dimension in School? School is of course embedded in specific political realities but, it’s important to understand that it addresses these realities in an oblique way. Significantly, some of the strategies we discussed earlier amount to a political positioning in themselves, although in a different register than geopolitics: there is considerable value here to a multiplicity – of voices, for example, or of modes of disputation. There is also the way in which visitors are affected and implicated in the installation, the heightened condition of translation, and the absence of representational images. All these things are political in a sense. I have an interest in how visitors to School might begin to think differently about how education functions within their own society and culture, and how it relates to subjectivity. In fact, during its first presentation at the Folkestone Triennial in 2011, I spent many days observing the audience inside the installation and had conversations with them about their experience of the work. It was striking how many wanted to discuss their own education in comparison with elements in the work. Everybody is touched by education, of course, which is part of why it’s such a politically hot issue around the world. Yes, it is always intertwined. For example, in the context of Israel there’s recently been a stormy internal debate that most non-Israeli audiences would not be aware of, regarding how politically charged issues and political views should be discussed by teachers in secondary education. Some teachers have been accused by politicians from the right of bringing politics and personal political views into the classroom. As if there could be an education without politics. Exactly. These teachers pointed out that it would be impossible to cover the curriculum without discussing politically charged issues at all, especially in the teaching of citizenship. And Israel is not alone in having disputes over the place of politics in education: for example, in the United Kingdom right now there is a debate raging about changes to the history curriculum that the current Minister for Education is trying to push through, and which many regard as highly ideological. This brings us to the politics of subject formation. The school is a key example of what Louis Althusser calls an “ideological state apparatus.” It’s not a repressive apparatus like the police or the prison, but it is nonetheless an apparatus for producing and reproducing subjects, for interpellating subjects to the ideology of the state. I think we can definitely see this understanding of the educational institution at play in School. But unlike Althusser, who has a rather totalizing view of ideology, you offer something a little more open and conflicted. We feel that force of interpellation, but we also see counterforces that are actively trying to negotiate it. I was surprised at how willing and eager the pupils are to assert their own views, sometimes really contradicting what the teacher is saying. It is interesting to see that place where these discursive negotiations happen and how they happen, but as an artist, I am not out to illustrate a particular theoretical position. I think it’s clear in School that the reproduction of ideology is not seamless and it’s not total. As far as I’m concerned, education is a process of hit and miss from which subjectivity emerges. The commotion and social dynamics of the classroom enable the visitor to feel the insecurity of being a teenager. School shows that being a teenager is fraught, partly because there is resistance to conforming to the expectations of the institution, and partly because as teenagers they are in a state of being “in-between”. At the same time, we hear the pupils in class being repeatedly told, “Think for yourselves!” These contradictory demands confuse what is resistance, what is conformity, and what is interpellation. There’s a tension between resistance and conformity here, and I think this tension is telling, because it is something that is not entirely controllable or predictable by the institution. Also, for me, this has a relation to the importance of ambiguity: if, in School, visitors are positioned in a place of contradictions and uncertainties, it does not mean that they are left without meaning – on the contrary. Dieser Text ist eine gekürzte Fassung des im Februar 2014 geführten Interviews, zuerst erschienen in: Hila Peleg, Erika Balsom (Hg. ), Berlin Documentary Forum 3. Berlin 2014, S. 164–169. 1.) ‚School‘ (2009-11) Seven channels of HD Video / 42 channels of Sound / specially constructed Architecture. Duration: Seven synchronised lessons of 24 minutes each and a 3 minutes school break, on a loop. Excerpt of Lesson 1 of 7: History (12‘30“ from 25‘17“) are linked via QR code. (*1963) is a London based Israeli artist. Examining a socio-political context and how it is reflected in everyday life, her practice investigates the role of the voice in the constitution of contested public spaces. She uses real life recordings and architectural structures designed to choreograph viewers in the space and to explore conditions of translation. Solo exhibitions include BDF3 Haus der Kulturen der Welt, Berlin, Magasin 3, Stockholm, Extra City, Antwerpen, IKON Birmingham. Group exhibitions include The 2011 Folkestone Triennial, UK, S.M.A.K. Gent, Mediations biennial, Poznan, MUSAC Leon, Spain, and the 9th Istanbul Biennial. (*1982) is a lecturer in Film Studies and Liberal Arts at King’s College London. Her research concentrates on the history of experimental film and the place of the moving image in art. She is the author of Exhibiting Cinema in Contemporary Art (Amsterdam University Press, 2013) and co-editor, with Hila Peleg, of the publication for Berlin Documentary Forum 3 (2014). Her articles have appeared in venues such as Afterall, Artforum, Cinema Journal, and Screen and she has lectured widely at venues such as the Carnegie Museum of Art (Pittsburgh), Centre Pompidou (Paris), Light Industry (New York), and the Stedelijk Museum (Amsterdam).